Well this is week nine, where does the tie go. This week has been interesting. Over the weekend I spent way too much time on Tanglepattens.com, deciding which tangle to use this week. As number nine is one of my favorite numbers I wanted something special. Well yesterday I sat down, to do a tile for the adventure, and started tangling. 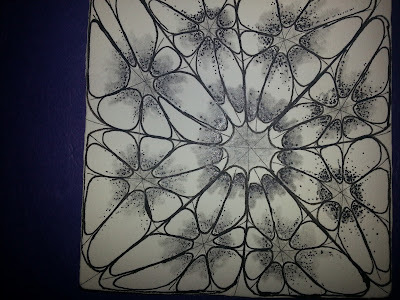 As can happen in Zentangle® what came out of my pen was not the Tangle I planned. So I will postpone the previously chosen tangle, and allow ‘Nzepple to be the pattern for this week. I really love Nzepple as a tangle, so I am in no way surprised this happened. I ended up doing a large tangle, then filled each section of the tangle with a smaller version of the tangle, I really like how this turned out. If you have not done ‘Nzepple before, you can find out more about it Here. And here is My ‘Nzeppel Zentangle® Tile! Nine is a composite number, its proper divisors being 1 and 3. It is 3 times 3 and hence the third square number. Nine is a Motzkin number. It is the first composite lucky number, along with the first composite odd number. Nine is the highest single-digit number in the decimal system. It is the second non-unitary square prime of the form (p2) and the first that is odd. All subsequent squares of this form are odd. It has a unique aliquot sum 4 which is itself a square prime. Nine is; and can be, the only square prime with an aliquot sum of the same form. The aliquot sequence of nine has 5 members (9,4,3,1,0) this number being the second composite member of the 3-aliquot tree. It is the aliquot sum of only one number the discrete semiprime 15. 8 and 9 form a Ruth-Aaron pair under the second definition that counts repeated prime factors as often as they occur. In bases 12, 18 and 24, nine is a 1-automorphic number and in base 6 a 2-automorphic number (displayed as '13'). A polygon with nine sides is called a nonagon or enneagon] A group of nine of anything is called an ennead. This works for all the multiples of 9. n = 3 is the only other n > 1 such that a number is divisible by n if and only if its digital root is n. In base N, the divisors of N − 1 have this property. Another consequence of 9 being 10 − 1, is that it is also a Kaprekar number. The sum of the digits of 41 is 5, and 41-5 = 36. The digital root of 36 is 3+6 = 9, which, as explained above, demonstrates that it is divisible by nine. 36957930 - 35967930 = 990000, a multiple of nine. 99765330 - 35967930 = 63797400; 6+3+7+9+7+4+0+0 = 36; 3+6 = 9. 99765330 - 03356799 = 96408531; 9+6+4+0+8+5+3+1 = 36; 3+6 = 9. 35967930 - 03356799 = 32611131; 3+2+6+1+1+1+3+1 = 18; 1+8 = 9. Like your shading and the stippling that you did. 'Nzeppel is one of my favorite tangles. I love your 'Nzeppel Roy. I like the (vague) contrast. And I owe you a BIG thank you for making me draw this difficult tangle. I don't think this will ever be one of my favorite tangles, but I'm like Jean, I have to thank you Roy for making me think outside my comfort zone and learn something new to me. That's one reason I like to participate in challenges they keep me from falling into only what comfortable. All done! This one was more challenging to get a unique take. Thanks for introducing to me to this tangle! It has quickly become a new favorite of mine. and I didn't mean to double link. I thought I mis-clicked the first time. If you're able to delete entries go ahead and delete my first one. It was the wrong link anyway. It jumps to my comment section instead of the top of my post.